I've not posted for a while, I've been feeling sorry for myself and had to give myself a good talking to. I'll talk about that in a moment but first here are the candle holders I showed you a couple of weeks ago. The one above started life as a pasta sauce jar. I have put pebbles in it to add weight and to lift the candle up to the window. I made another one from an old coffee jar and left the string unpainted. 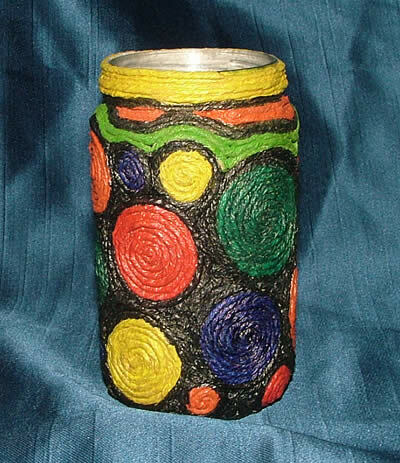 They make great outdoor candle holders as they protect the candle from the wind. I have made a tutorial for these Outdoor Candle Holders on my website. I'm off to check out all the other craft stories at Wendy's blog 1st Unique gifts for this weeks Handmade Monday. Do pop over and have a look as there are some very talented people posting there. It's not fair! Why me? I have many things to be thankful for and I know I shouldn't feel like this but it is hard sometimes. Now if you want to hear my rant about why I've been feeling down here it is you've been warned. I had my ears tested a few weeks back, as my tinnitus has got worse. I've had moderate hearing loss for years since I was a child so I'm used to not hearing well. The audiogram showed I now have severe hearing loss and if it continues at the same rate I could be profoundly deaf within 5 years. I took it in my stride but now I'm having problems with my eyes, double vision and dark patches. It is thought that this may be due to my fibro and will occasionally flare then get better. I know I'm whining but I've always had perfect eye sight and I lip-read, if I lose my sight I will be totally isolated. So I've been feeling scared and sorry for myself but I've given myself a good talking to and will now stop whinging. Sorry for the rant and thanks for listening. 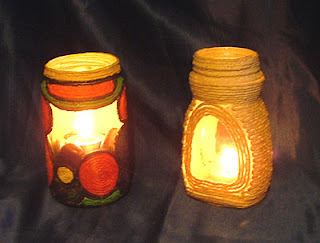 Your jar lanterns are great! very original designs and they look great with the light inside! Love the candle jars. You are entitled to feel sorry for yourself, let's face it we all do and you certainly have some hurdles to jump and agree it is scary. Take care. Thanks for all your lovely comments and support, it means a lot. Love those jars - the coffee jar one is particularly nice. Sorry to hear about your health problems. Hope you find some answers soon and can get some help to stave off any further deterioration. A great tutorial and easy to follow. They would look really good on my patio. It's good to let off steam now and again, I hope you are not feeling too down and things improve.